Meet Sloane Emily Jacobs: a seriously stressed-out figure-skater from Washington, D.C., who choked during junior nationals and isn�t sure she�s ready for a comeback. What she does know is that she�d give anything to escape the mass of misery that is her life. Now meet Sloane Devon Jacobs, a spunky ice hockey player from Philly who�s been suspended from her team for too many aggressive hip checks. Her punishment? Hockey camp, now, when she�s playing the worst she�s ever played. If she messes up? Her life will be over. I�m not sure if anyone else will remember the made for TV movie Ice Angel staring Nicholle Tom but when I first read the synopsis of Being Sloane Jacobs by Lauren Morrill, �I have to admit I almost envisioned something like that crossed with The Parent Trap. For those of you who may not remember Ice Angel, or who may never have seen it, I�ll give a brief review. The movie is about a male Olympic hockey player and a female Olympic figure skater who both die on the same day but the soul of the skater goes to heaven but the hockey player is reborn in the body of the ice skater. So the hockey player must learn how to figure skate while still having memories of being a hockey player and wanting to return to his former life. It�s a cute movie, and was definitely one of my guilty pleasures a teenager. Anyway, like I said when I first heard of Being Sloane Jacobs, I almost immediately envisioned a meeting of the minds between Ice Angel and The Parent Trap. This made me pretty excited, and I was even more excited when I requested it on Netgalley, and was approved. 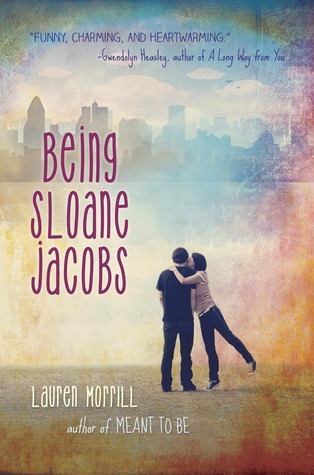 Being Sloane Jacobs has two main characters: Sloane Emily Jacobs and Sloane Devon Jacobs. Sloane Emily is from Washington, D.C. where her family�s image is more important than anything and the closets are filled with skeletons. You see, her father is a wealthy senator, and what he says goes. Well, until Sloane catches him in his office doing some things he really shouldn�t have been doing, and then everything changes for them. And to make things even worse for her, she�s being shipped off to Montreal to figure skating camp which is the last place she wants to be. She�s lost her passion for skating, and her respect for her family and what she would love more than anything is a new life. Comparatively, Sloane Devon is from Philadelphia and is struggling with family problems of her own. Her mother is in rehab dealing with alcoholism so it is just her and her father at the house right now and she is not handling it well. She feels angry and abandoned and begins taking it out her emotions on the ice. One night after getting into a fight with a player on an opposing hockey team during a game, her coach and her dad decide to take matters into their own hands, and send her off to spend her summer in Montreal at hockey camp. So, what happens when the two Sloane Jacobs meet? A little Parent Trap magic of course! Both characters are tired of their current lives and desperately wishing to be someone else for just a little while. Together, they hatch a plan to trade lives for the summer: Sloane Emily will learn how to play hockey while Sloane Devon will learn exactly what it takes to be a figure skater. And most importantly, each girl will learn who she is, and that she is stronger than she ever truly realized. Personally, I connected with both of the Sloane�s in different ways, and was rooting for them to each have a summer of self discovery and fun. I wanted both of them receive their happy ending. I really liked the way both of them developed through the course of the story, and found that in the face of various personal adversities they could push back and come back stronger and fierce as ever. Also, the romances in the story were sweet, romantic, and did a good job of being realistic during the context of the story. Another thing I really enjoyed was the setting descriptions. Lauren Morrill painted Montreal so vividly that I felt like I was there even though I�ve never actually visited Canada before. I loved spending time in the setting that was presented with characters and moments that I could really connect to as a reader. I also liked how much figure skating and hockey were intertwined within the story. I was a bit surprised at how long it took others to figure out what exactly was going on within the story but the little surprising twists and turns that were put into the story made it that much more enjoyable to read. Being Sloane Jacobs did not disappoint me in terms of what I was looking for as a reader. It had moments of true character development that had me standing up in the stands and cheering as loud as possible while also having moment that made me smile with regard to sweetness and sensitivity. I would recommend this story to fans of YA contemporaries and to anyone who is a fan of Ice Angel, The Parent Trap, or The Cutting Edge, and has always imagined what it would be like if any of them were turned into book form. I have never heard of Ice Angel. I’m thinking I need to check it out. I haven’t read Being Sloane Jacobs, but I think now might be a good time. I’m craving contemporary, easier books. Also, yay for Parent Trap references!! I loved BEING SLOANE JACOBS! It was such an adorable book. Even though it definitely had similarities to Parent Trap/Cutting Edge/Ice Angel, Morrill also managed to make it feel completely different. Her characters are excellent – especially the two Sloanes – and the little twists and turns were awesome. Glad you enjoyed it too!